Here in the shadows of the Mogollon Rim, the residents of Payson welcome you to the "Friendliest town in the West," where you can enjoy a quality of life that ranks among the best anywhere. A near perfect, four-season climate is one reason Payson was listed as one of the most popular places in the country for second homes, and ranked the 10th fastest-growing retirement community in the nation. The air in Payson is as clean as it was a century ago earning a rating by Sunbelt Retirement magazine as one of the three healthiest places to live in the entire world. Payson rests at the base of the majestic Mogollon Rim, a 7,000 foot high, 200-mile long escarpment in the world's largest Ponderosa Pine forest. The Rim and the Grand Canyon constitute Arizon's two most spectacular landforms. A variety of mountain lakes and trout streams, hiking trails and campsites are within minutes of the center of town. When Zane Grey's travels brought him to Payson in 1918, he hired a guide from the pioneer Haught family to take him to the top of the Rim. "At last, we surmounted the rim," he wrote in Tales of Lonely Trails, from which I saw a scene that defied words. It was different from any I had seen before. Black timber as far as the eye could see! Then I saw a vast bowl of forested ridges, and dark lines I knew to be canyons. For wild rugged beauty I had not seen its equal." Largely preserved as the Tonto National Forest, the area today remains much as Zane Grey described it. The land is big enough to accommodate recreationalists of all persuasions. From hikers to families with picnics, bird watchers to campers, trout fishing experts to kids with bobbers, and hearty backpackers to nature photographers .... Arizona Rim Country has what you are looking for. Come be a guest in our backyard, the "Friendliest town in the West." Under the Tonto Rim, Code of the West, To the Last Man, are all western thrillers written by Zane Grey, one of the most prolific writers of all time. The inspiration for these and many of Grey's 85 novels, 114 movies, and 215 short stories was the Tonto Rim, also known as "
The museum, which is housed in Payson's 1906 Forest Service ranger station and a replica of a historic local hotel, contains an extensive collection of artifacts and memorabilia, telling the history of the Rim country and focusing on what life was like as a forest ranger in the early years. 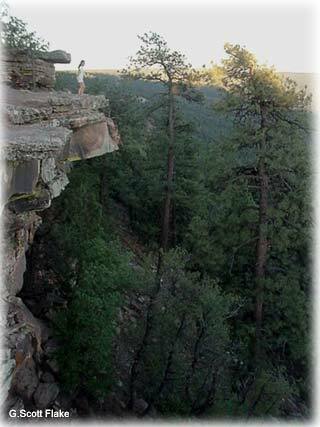 The Mogollon Rim, Arizona's mighty backbone, is an epic in natural, human history.